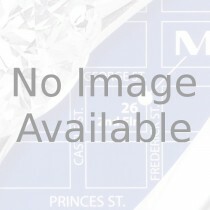 Diamond Cluster & Dress Rings	There are 38 products. 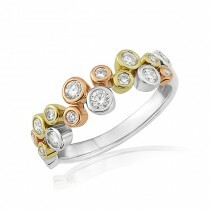 16 round brilliant cut diamonds of varying weights in multi-coloured gold settings, resembling bubbles on your finger. The total diamond weight is 0.47cts. This style of ring can be made in a variety of colourways and in platinum too. 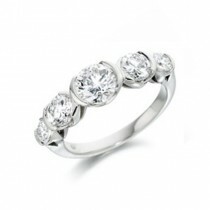 Resembling a large three stone ring, this cleverly designed multi-stone ring comprises three diamond clusters in a row. Each separate cluster has nine overlapping pavé set round brilliant cut diamonds with four outer claws. The effect is a large and stunning ring with remarkable fire and brilliance. Sparkling like champagne, the centrepiece of this platinum engagement ring is a near three quarter carat, cushion cut diamond. The stone is GIA certified as a Natural Fancy Yellow diamond and is itself surrounded by a halo of fine pavé set, contrasting white diamonds with further diamonds on the shoulders. This delightful ring is one of our most popular dress ring styles. 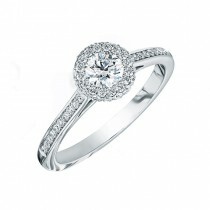 It comprises three white gold wires scattered with six bezel set diamonds with a total weight of 0.22cts. Although delicate in look, this ring has a ridged white gold construction and a heavy 2.5mm shank - not hollowed out like many cheaper versions - and weighs 4 grams. 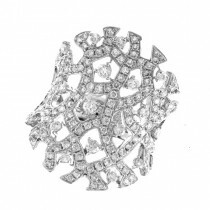 142 round diamonds are used in this unusual filigree ring. Being slightly convex, it sits comfortably on the finger (even though it is over 25mm long) with the filigree design continuing into the shank. The total diamond weight is 1.48cts. Gross gold weight: 8.5 grams.